The problem with my life was that it was someone else’s idea. It’s funny how just the other day I was talking about writing craft, the combination of skill and care that is so important when putting together a story and how certain books unfortunately fail in every conceivable way. 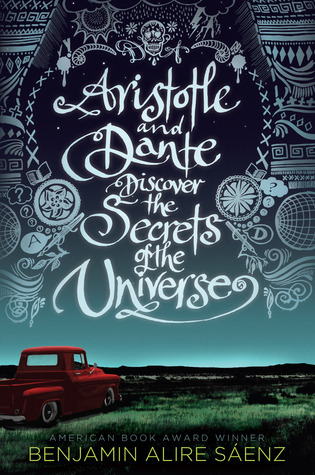 It is possible that Aristotle and Dante Discover the Secrets of the Universe is the antithesis to every single terrible book I’ve read lately. In fact, Aristotle and Dante is the kind of book that gives me hope that the universe might be still be an ok place to live, that publishing is not only a heartless business but also a place where craft still survives and good stories live on. You just need to be able to find them. And what a find Aristotle and Dante turned out to be. It’s the story of two friends, Ari and Dante, who meet when they are fifteen, during a summer of utter boredom. Their friendship is a balancing act: sweet and tender, playful and serious, full of intellectual interactions and questioning about life, the universe and everything. It is a beautiful story of friendship – although their friendship does eventually develop into an AWESOME romantic relationship that comes from falling in love with a person you already love so much. I like just-friends story and they are so important but Ari and Dante’s friends-to-lovers story felt so right there is no resentment from this reader. The story is narrated by Ari and it’s his point of view that colours the narrative. Ari is a loner who likes to wallow in its loneliness and who is in a state of constant anger: at the secrets his family keeps from him, at his father for not being open and talkative. Dante is in a way, his opposite: quick to laugh and play, an artist and philosopher as well as a crier. Except as it turns out, they are not so different after all – and soon Ari learns to love poetry and philosophy and words whilst still being the same questioning, angry Ari (it takes him some time to learn that boys can cry too). The letting go of this anger (for a myriad of reasons) is one of the driving points of the novel and one that comes with a series of moments of self-discovery and life-discovery. It’s very interesting too the way that Ari’s narrative is somewhat unreliable although not on purpose because it is very clear that Ari represses his feelings and don’t tell us how he truly feels about certain things because he doesn’t know them either – but his actions speak more than a thousand words. Aristotle and Dante is a smart, intelligent, engaging coming-of-age story and a deep, thoughtful exploration of identity and sexuality. It turns out that both Ari and Dante are gay although it takes Ari the whole book to come to terms with it, whereas Dante is much more conformable in his own skin when it comes to his sexual identity. But there are other sides of who they are that are also thoughtfully examined here: both are Mexican-Americans and both ask themselves what does that even mean. She sounded a little angry. I loved her anger and wished I had more of it. Her anger was different than mine or my father’s. Her anger didn’t paralize her. Both Ari and Dante are on the threshold of adulthood and the book is sublimely competent in evidencing those moments when you are trying to define who you are as well as who you want to be and how teenagers feel the need to be treated like people. There is family history and influencing, social restrictions and expectations of what a man should be, violence and bigotry as well as love and acceptance and thematically speaking, this is a book that hits all the right spots. Every character is fantastically portrayed and I just loved how this is also a book about families, about relating to them and especially how finding out who you are does not stop when you become an adult, it is an ever evolving narrative of your own life. There is a lot of care given here to Ari and Dante’s parents as well. All of that put forth in a way that blew my mind away. Here is where I go back to the issue of writing craft. Because this book? It’s beautifully, impeccably written. The writing is very straightforward, simple and concise. BUT never ever simplistic and one gets the feeling that every word is chosen very precisely, very carefully to create a profoundly affecting story with an intricate narrative. It is a book that trusts its readers too – no pandering here – and there are pages and pages of pure dialogue where the reader must fill the gaps. This amazing writing skill is also present in terms of “voice”. The story follows the two boys for two years, and the narrative voice matures just as much as the two do – Ari and Dante start very young-sounding and immature then as the story progresses they both sound older. I think the best thing I can say about the book is how I can see Aristotle and Dante Discover the Secrets of the Universe as a book that can be picked for a lit class to be dissected for its craft and examined for its themes BUT only after the reader is able to recover from becoming a blubbering mess of FEELINGS and ensuing powerlessness to form coherent thoughts all because they identify so much with the story. Aristotle and Dante discovered more than the secrets of the universe – they also discovered the secrets to my reading heart. All afternoon, I sat in that large comfortable chair in Dante’s room and he lay down on his newly made bed. And he read poems. I didn’t worry about understanding them. I didn’t care about what they meant. I didn’t care because what mattered is that Dante’s voice felt real. And I felt real. Until Dante, being with other people was the hardest thing in the world for me. But Dante made talking and living and feeling seem like all those things were perfectly natural. Not in my world, they weren’t. I went home and looked up the word “inscrutable.” It meant something that could not easily be understood. I wrote down all the synonyms in my journal. “Obscure.” “Unfathomable.” “Enigmatic.” “Mysterious.” That afternoon, I learned two new words. “Inscrutable.” And “friend.” Words were different when they lived inside of you. you don’t understand how much this has made my heart swell and my throat clog up with tears. I don’t think I can adequately articulate how much this book meant to me as a reader. it was just perfection, utter utter perfection. so sincerely beautiful and I get what you mean about the writing craft, because it just pours from the page that he has incredible talent as a writer. i said the other day that when I finished the book I felt exactly the same as i did when i’d finished Code Name Verity, and that it was funny that I read CNV in Jan 2012 and knew without a shadow of a doubt no other book that year would come that close to greatness, and thats exactly how I felt when I finished this book. so so deserving of all the praise and awards and I really hope it encourages more people to read it. Wow, sounds like a great one! Fantastic review. I love a good friends-to-lovers story. They’re so much better than the insta-love thing that is so prevalent right now. Although, has anyone else noticed how hard it is to find a story about friends rather than a romance? I hadn’t realized how rare they are until I started searching for one (I’ve been in the mood lately for a good friendship story). Friendships always seem to get sidelined for the romance or they turn into a romance. Wow! “Perfection” That’s rare from you guys. LMoved up to number one on my list. Wow. This book sounds amazing. I’ll have to pick it up! I’ve been in a total book slump these days. Like you, this book gives me hope. What gorse prose. Instead of “gorse” make that “gorgeous” prose. Yes! Everything about this book is beautiful. I am in awe of EVERY SINGLE relationship in this book. From the glory of Dante and Ari to them with their parents and even them with each other’s parents…I can’t even begin to imagine anything more lovely then seeing the people in this book interact. Seeing Ari finally discover himself at the end has to be one of the most touching things I’ve ever read. It is one of those books that makes me scared to read anything else. Anonymous – Here are some books about friendship that I’ve enjoyed. They’re a mix of YA and middle grade books. Ashbury/Brookfield books by Jaclyn Moriarty – linked to Ana’s awesome review of the series, which led me to reading these wonderful books. Ana, I couldn’t agree with you more about the level of writing craft in this book. You can tell that Mr. Saenz is a poet from his precise use of words. Not one word wasted, not one superfluous word. Razor sharp writing but not either in a cold, surgical way or flashy, look how clever I am way. Just perfectly precise. It’s lovely to have teens with a real, loving relationship with their parents. Parents who are real people, there for their kids, who love them and are loved by them – flaws and all. Yes, there are horrible parents out there but there are also loving, wonderful ones that are not reflected as much in books these days. So, I enjoy them when I come across them. He had this hungry way about him. He was the skinny type. Always looked like a coyote in the middle of a drought. I knew about coyotes. You could smell the rain in the desert even before a drop fell. I closed my eyes. I held my hand out and felt the first drop. It was like a kiss. The sky was kissing me. Even though summers were mostly made of sun and heat, summers for me were about the storms that came and went. I came to understand my father was a careful man. To be careful with people and with words was a rare and beautiful thing. I loved this book and the characters, feeling and writing have stayed with me. Always a sign of a powerful book. This book blew me away when I picked it up from my library this past summer. My heart is so full of happiness to realize people are picking it up and seeing just how good it really is. I absolutely loved Saenz’s Sammy & Juliana in Hollywood and Last Night I Sang to the Monster…but I just couldn’t get into this one at all. I was pretty disappointed since I wanted to like it so much. But I do agree about his writing, the other two novels I’ve read by him are gorgeously written; he apparently started out as a poet, and it shows. This sounds like this book could be a breath of fresh air in a reading trend. I am adding this one to my TBR. I just finished this one also and couldn’t wait to tell everyone they needed to read it right away. It makes me so happy to see this beautiful story finally getting the attention it deserves! ICYMI: NPR has an interview with Benjamin Alire Saenz. You can read the article, listen to the interview, or read the transcript. 12 minutes and very interesting. I also felt that this book was so carefully crafted and gave me a better, more realistic, look into relationships. In this day and age, romance is about excitement and spontaneity, but those things don’t last usually. The way Dante and Ari need each other is beautiful. The end was PERFECTION. I wish there was more SO much. I miss Ari’s voice and Dante’s amazingness. I get the feeling that people are only praising this book because of the idea behind it. If you look beyond your own feelings on the main idea, this book reads like something a Jr high kid would have written as an assignment. The characters were portrayed as much younger than they were said to be. Almost every page…”we laughed” All through the book… “he laughed” “she laughed”. Good authors don’t have to detail every last move of every character. The readers imagination didn’t have to do any work with this book which took the fun out of reading it. Thank you for another magnificent article. Where else may just anybody get that type of info in such an ideal approach of writing? I’ve a presentation next week, and I’m at the look for such info.